Tavistock Development Company’s scattered offices weren’t connecting people to each other or to the organization’s purpose: to create healthy, vibrant places to live. 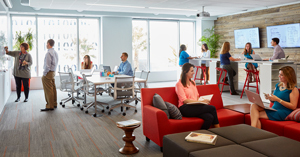 With Living Office®, the real estate development firm created a unified workplace that’s just as vibrant as the communities it builds for clients. At Tavistock Development Company, people don’t eat lunch at their desks. Why would they, when they can enjoy a meal in the real estate development firm’s bright, window-lined café. Against a backdrop of palm trees lazing in a blue Florida sky, accountants mingle with project managers, administrative assistants laugh with legal counsel, and marketing specialists catch up with urban planners. People who wouldn’t normally spend a ton of time together during the workday are getting a glimpse of what others are working on, and they are having fun doing it. As part of the research, Herman Miller guided employees and leaders through the Living Office Discovery ProcessSM. This workshop helps organizations identify their purpose, business priorities, character, and activities. The results of this research proved that the new space would need to enable the highly collaborative activities Tavistock employees do throughout the day. These include lengthy conversations, longer periods of collaborative project development work, and quick, impromptu discussions— activities known as Converse, Co-Create, Divide & Conquer, and Chat in Living Office parlance. The employees’ workstations are also outfitted to help people focus on their work for long periods of time, and then swiftly adapt when a colleague drops by with a question. The ultra-ergonomic combination of Renew™ Sit-to-Stand Desks, Flo® Monitor Supports, and Embody® Chairs keeps people more active throughout the day and gives them the flexibility to place technology devices in positions that are comfortable for viewing. Another motivating factor for the new office had been improving the company’s ability to attract—and keep—talented employees. All of these changes have culminated in a significant improvement in overall workplace effectiveness and employee satisfaction for Tavistock. To quantify this improvement, Herman Miller guided leaders and employees through a Leesman® Survey. Leesman is a global benchmarking service that gathers and analyzes data on workplace effectiveness from hundreds of organizations. While Tavistock’s previous accommodations scored 48.7 out of 100 on the Leesman Index for Workplace Effectiveness, its new headquarters received an 85.5— more than 25 points higher than the Leesman Global Benchmark of 60.7. This excellent rating garnered Tavistock a Leesman+ accreditation. Learn more about Living Office at HermanMiller.com. Read more Living Office case studies.